In the previous module, you started learning about using sources to make your essays more academic. Pay attention to the four different ways that I’m going to show you for how to use sources correctly. Plagiarism is using someone else’s words or ideas as your own. If you use someone else’s words or ideas for any reason, you’re committing plagiarism. On the left I highlighted something that’s blue, and on the right side I made it pink to show you how the student changed a few words. He is plagiarizing because he took words and ideas and did not give credit to the original author. Can you find some places where the student has plagiarized? Again, this student thought he could change a few words to make his writing look different, but it is clear that his writing is copied from the original source. He can change some words, but he needs to cite the source. We can still find places in black where the student is using the exact same words as the original source, and the student doesn’t put those words in quotation marks to show us that they’re someone else’s words. So this looks like those words are all the student’s words. The student is pretending that all of these words are his, because he didn’t cite the source. It is using someone else’s words or ideas as your own. It doesn’t matter if you intend to use the words or if you accidentally use the words. You see that the words that are black are exactly the same as those black words in the original. The pink words are the student’s different words that they used but they’re almost the same and the grammar is exactly the same as the original source. Remember, the reason why this is plagiarism is because the student is pretending these are his own words. First of all you have to put quotation marks around any word that you borrow from another source. This is the first way that you can prevent plagiarism when you’re borrowing words from another source. Over here on the left you can see the source information Gregory Watchman is the author of those words on the left, so when the student uses this information in his essay, he chooses here to use attribution. Notice that the quoted words are exactly the same and we put quotation marks around them. Now it’s very clear that these are not the student’s words, they come from another source. 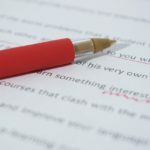 The second way to prevent plagiarizing when using someone else’s words is to use a direct quote but without attribution and that’s what this student does. The student still put quotation marks around all of the part that is borrowed from the original source. So the student used his own words and grammar to repeat the idea of the source, but when the student does that he still has to give credit to the original source. The student could not pretend that this was his idea because he got it from another source. As we said, this is without attribution, so the student gives credit to the original source at the end of the sentence. You’ve probably noticed that there are some words here that are exactly the same as the original source. The rule is that in your paraphrase, it’s okay to have a word or two that are the same as the original source. If you have more than three words that are the same, then you need to use quotation marks.